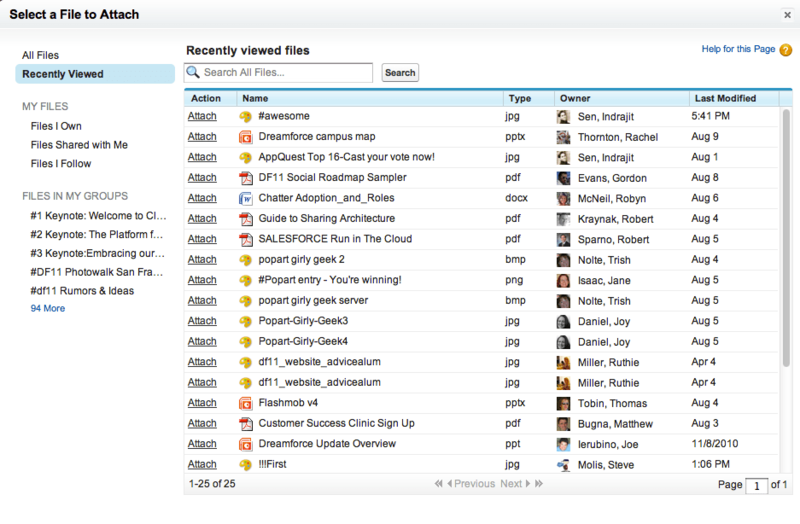 Salesforce Administrators learn to remind users: “Search before you create a new lead.” Pretty simple, right? Duplicated records are a pain. Then why do I see some very accomplished Salesforce users in the Dreamforce app posting duplicate Content/Files in Chatter? I've learned my lesson in the past 8 months... I promise! The better thing to do – assuming that you need to post the same file multiple times (this should be rare, as it might be considered Chatter Spamming, but when referring multiple users or groups to a document, it can come in handy) is to upload the file ONCE and use references to it in subsequent feed posts. This has a bonus: Better maintenance! Instead of other users not knowing which file to follow if they want to be notified anytime that file is updated, just ensure that there is only ONE copy in the org, and everyone can follow that. This is especially useful for legal documents, employee handbooks, FAQs, Dreamforce App Codes of Conduct… you get the idea. And there you have it! Go forth and attach! … and after that, just link.